"We all share a common conviction – that girls and women are the key to building healthy, prosperous and sustainable societies and communities," said Her Royal Highness the Crown Princess of Denmark, Patron of the Women Deliver Conference 2016 and Patron of WHO/Europe, at the Conference's opening ceremony. "And the evidence is sound – when we invest in girls and women, society as a whole benefits." 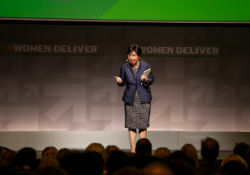 Over 5500 advocates, experts and young people gathered in Copenhagen, Denmark, on 16–19 May 2016 for the fourth Women Deliver Conference. With more than 200 sessions and side events, this was the largest gathering on the health, rights and well-being of girls and women in over a decade. Attendees and speakers from 168 countries worldwide took part. WHO/Europe and Member States participated in discussions on the latest trends, innovations and research to drive solutions for girls and women. The European Region was referred to several times during the Conference not only as a donor or as an example of progress but also as a Region where women's health is challenged and problems persist. This is especially the case with regard to sexual violence, the health of migrant girls and women and access to sexual and reproductive health services, including family planning and abortion. WHO/Europe used the Conference as a platform to share examples of both successes and further development needed for girls and women. Within the WHO European Region health inequalities between and within countries persist – for example, according to the latest estimates the maternal mortality rate is 25 times higher in some countries in the Region than in others. The European action plan for sexual and reproductive health and the European strategy for women's health currently under development were also discussed at the Conference. WHO contributed to a variety of sessions addressing the Sustainable Development Goals (SDGs). Emphasis was placed on how to implement the SDGs as they relate to girls and women, with a specific focus on health – in particular maternal health; sexual and reproductive health and rights; and violence against women – and the interconnections with gender equality, education, environment and economic empowerment.